A shift in power always brings tension. Tension brings conflict. As long as the tension is resolved via debate–based in facts and not fear—this tension can serve to be a powerful force for positive change. Change is scary, but that’s why the FSM made unicorns. 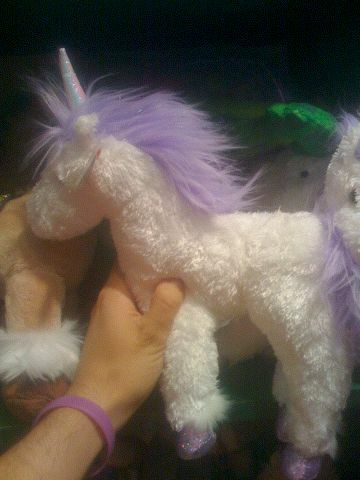 Enjoy people-change is coming, and won’t be as soft as my plush unicorn. Speaking of change, I’m looking to add a podcast by 1/1/09. Frequent readers will be invited to contribute. This entry was posted in iPhone Blogging, Politics and tagged nablopomo, prevention, unicorn. Bookmark the permalink. Nublet’s got one kind of like that. Maybe I’ll borrow it. I have a stuffed hippo which is pretty darned soft, but somehow I don’t think a hippopotamus chaser is really what anyone’s looking for.